Smith is the creator of The Shower Belt, a device designed to remove the danger of drowning in the shower for people who experience seizures or falls. It was invented after the sudden and tragic loss of his friend Natalie Fryzak, who drowned in the bathroom due to a seizure. With Natalie’s passing Richard began doing research, looking to find a device designed to remove this problem, or at least control it, but found nothing. Being a certified welder and metal designer, he took it upon himself to work towards a solution. It’s taken him 10 years, and many different designs – he says he’s got a museum full of them (including one that involved a hockey puck!) – but now his hard work has paid off. The Shower Belt is simple and effective and has caught the attention of Ryerson University’s Design Fabrication Zone. They offered him a mentorship through their “business start-up program.” He now has direct contact with industry leaders any time he needs advice. 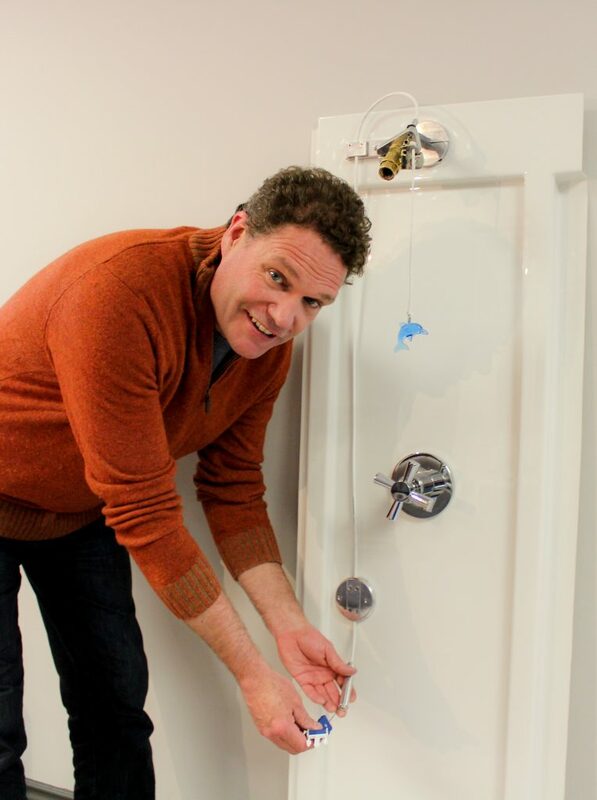 Having Ryerson University see the potential of the Shower Belt, and invest their time and resources in helping to bring the device to market, has been a big boost for the project. Richard’s dreams for the Shower Belt’s ability to help people living with epilepsy don’t end in in the shower. Once the device is ready to go to market, he plans to set up an assembly plant that offers a supportive work environment and stable employment for people with epilepsy, and other diseases and disabilities. His business concept is to bring people from the community together, and give them a chance to create their own niche business serving themselves. But before Richard’s Shower Belt can hit the market, it needs to be tested. His next step is a three-month trial. For this, he is looking for 6 – 10 volunteers. He and a licensed plumber will install the shower belt in their home, contact them once a week to find out if the device was used and visit them once every few weeks to check to make sure everything’s running properly. Once that three-month trial period is done, he will be looking to take the Shower Belt to the marketplace. To see a video of the Shower Belt (formerly called PSSOV Device) in action CLICK HERE. Previous PostOntario has New Guidelines for Epilepsy CareNext PostWhy Is Your Pumpkin Purple?